On my recent trip to Japan, Harajuku was the top of the list of one of the most fun places I visited. It is internationally the center of Japanese youth culture and fashion and not only was the visit colorful and unique but it was quite a Hello Kitty Foodie adventure as well! My number one reason for coming to Harajuku was to visit Reissue Cafe! Reissue Cafe is world-famous for their latte art! 💕☕️. Reissue is home to latte artist, Kohei Matsuno. He uses foam and chocolate to make the cutest 2D and 3D latte creations ever! My choice of course was Hello Kitty! Reissue is located a little off Takeshita Street; the main street in Harajuku that has their famous boutiques. Soon after I visited Reissue, I instantly spotted Eiswelt Gelato! Eiswelt meaning “ice world” in German; had its first store open in Westminster, California in 2016. What makes Eiswelt so special is their character gelato. You can get gelato shaped in cute animals like a teddy, piggy, chicken and bunny! It is only in Japan however that you can get a froggy! I had to get the froggy of course because it was very similar to one of my favorite Sanrio characters, Keroppi! For the froggy gelato, you can choose to either get mint or matcha flavours. I went with matcha; in true Japanese spirit! One doesn’t visit Harajuku without trying their famous crepes. Marion Crepes first opened up in 1976 as one of the only crepe shops in Harajuku. Marion Crepes started their crepe revolution in 1976 as one of the only crepe shops in Harajuku. They serve have Japanese-style crepes that are filled with delicious ingredients. I chose to get their Strawberry and Banana Chocolate Cheesecake Cream Crepe! The crepe itself was so soft. It is made with a secret recipe and is truly mouth-watering. Last bu definitely not least; I visited Pompompurin Cafe! Pompompurin, the Sanrio yellow golden retriever actually has three cafes in Tokyo but the original one is in Takeshita-Dori in Harajuku. The cafe is supercute and filled with bright yellow and brown tones to match PomPomPurin and their menu is filled with Pompompurin inspired dishes and drinks. My choice was the Pompompurin Cafe stew which had a combo of three different stews; carrot stew, squid ink stew and purple sweet potato stew that was topped off with cutest 3D Pompompurin rice 💛! 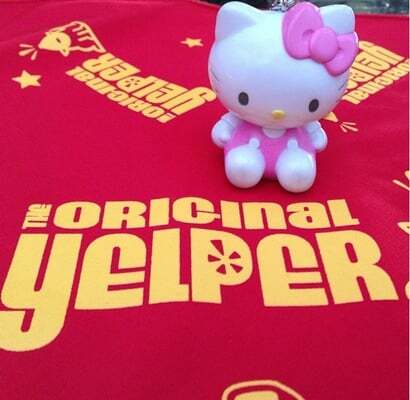 Harajuku was definitely a cute and colorful culinary Hello Kitty Foodie adventure! I loved visiting all the various cafes and eating the most kawaii creations ever! The French delight consisting of a thin pastry is quite hard to find in Southern California. much less place that offers both sweet crêpes and savoury galettes. Here at Creme de la Crêpe however they have variety of both the sweet and savory. All of their crêpes are even made with gluten-free crêpe batter. Aside from crêpes they have lovely dishes like risotto and pastas along with amazing wine selection. I started off with getting a savory crêpe. It was hard to choose from the various savory delights. They use local & organic produce as well as grass-fed beef & free-range poultry. I ended up getting the Marocaine. The Marocaine has jack cheese, spicy lamb sausage & madeira mushroom sauce. I don’t often get lamb but tonight I wanted to try something different and indulge in something special. Special indeed was the Marocaine. The lamb sausage was nice and tender and not spicy at all. I love the madeira mushroom sauce. There were several slices of mushroom and the sauce itself was thick and tasty. From savory to sweet, we could not pass up getting a sweet crêpe for dessert. Our choice was the Leila. The Leila was indeed one crêpe not to be passed up. Named after the owner’s daughter is this delightful sweet treat. In between the soft thin pastry were chunks of banana. On top of the crêpe was caramelized pecans, drizzles of caramel sauce and sprinkles of powdered sugar. The banana along with the pecans were amazing. A perfect match with our crêpe were the delightful Lavazza Italian espressos. Bold, rich and full of flavor; our espressos were the right companion to our sweet crepes. Dinner at Creme de le Crepe Rolling Hills was indeed a lovely time and my visit here all proved that I am indeed crazy for crepes. Crepe crush indeed.